Confessor and Jay brother, also called Alonso. He was born in Segovia, Spain, on July 25, 1532, the son of a wealthy merchant, and was prepared for First Communion by Blessed Peter Favre, a friend of Alphonsus’ father. While studying with the Jesuits at Alcala, Alphonsus had to return home when his father died. In Segovia he took over the family business, was married, and had a son. That son died, as did two other children and then his wife. Alphonsus sold his business and applied to the Jesuits. His lack of education and his poor health, undermined by his austerities, made him less than desirable as a candidate for the religious life, but he was accepted as a lay brother by the Jesuits on January 31, 1571. He underwent novitiate training and was sent to Montesion College on the island of Majorca. There he labored as a hall porter for twenty-four years. Overlooked by some of the Jesuits in the house, Alphonsus exerted a wondrous influence on many. Not only the young students, such as St. Peter Claver, but local civic tad and social leaders came to his porter’s lodge for advice tad and direction. 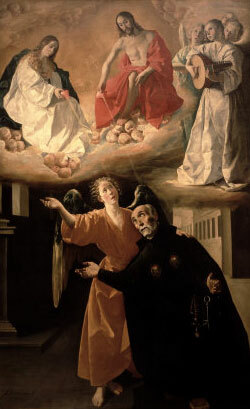 Obedience and penance were the hallmarks of his life, as well as his devotion to the Immaculate Conception. He experienced many spiritual consolations, and he wrote religious treatises, very simple in style but sound in doctrine. Alphonsus died after a long illness on October 31, 1617, and his funeral was attended by Church and government leaders. He was declared Venerable in 1626, and was named a patron of Majorca in 1633. Alphonsus was beatified in 1825 and canonized in September 1888 with St. Peter Claver. St. Narcissus Bishop of Jerusalem October 29 Second Century St. Narcissus was born towards the close of the first century, and was almost fourscore years old when he was placed at the head of the church of Jerusalem, being the thirtieth bishop of that see. In 195, he and Theophilus, bishop of Caesarea in Palestine, presided in a council of the bishops of Palestine held at Caesarea, about the time of celebrating Easter; in which it was decreed that this feast is to be kept always on a Sunday, and not with the Jewish passover. Eusebius assures us, that the Christians of Jerusalem preserved in his time the remembrance of several miracles which God had wrought by this holy bishop; one of which he relates as follows. One year on Easter-eve the deacons were unprovided with oil for the lamps in the church, necessary at the solemn divine office that day. Narcissus ordered those who had care of the lamps to bring him some water from the neighboring wells. This being done, he pronounced a devout prayer over the water; then bade them pour it into the lamps; which they did, and it was immediately converted into oil, to the great surprise of the faithful. Some of this miraculous oil was kept there as a memorial at the time when Eusebius wrote his history. The veneration of all good men for this holy bishop could not shelter him from the malice of the wicked. Three incorrigible sinners, fearing his inflexible severity in the observance of ecclesiastical discipline, laid to his charge a detestable crime, which Eusebius does not specify. They confirmed their atrocious calumny by dreadful oaths and imprecations; one wishing he might perish by fire, another, that he might be struck with a leprosy, and the third, that he might lose his sight, if what they alleged was not the truth. Notwithstanding these protestations, their accusation did not find credit; and, some time after, the divine vengeance pursued the calumniators. The first was burnt in his house, with his whole family, by an accidental fire in the night; the second was struck with a universal leprosy; and the third, terrified by these examples, confessed the conspiracy and slander, and by the abundance of tears which he continually shed for his sins, lost his sight before his death. Narcissus, notwithstanding the slander had made no impression on the people to his disadvantage, could not stand the shock of the bold calumny, or rather made it an excuse for leaving Jerusalem, and spending some time in solitude, which had long been his wish. He spent several years undiscovered in his retreat, where he enjoyed all the happiness and advantage which a close conversation with God can bestow. That his church might not remain destitute of a pastor, the neighboring bishops of the province, after some time, placed in it Pius, and after him Germanion, who, dying in a short time, was succeeded by Gordius. While this last held the see, Narcissus appeared again like one from the dead. The whole body of the faithful, transported at the recovery of their holy pastor, whose innocence had been most authentically vindicated, conjured him to reassume the administration of the diocese. He acquiesced; but afterwards, bending under the weight of extreme old age, made St. Alexander his coadjutor. This primitive example authorizes the practice of coadjutorships; which, nevertheless, are not allowable by the canons except in cases of the perpetual inability of a bishop through age, incurable infirmity, or other impediment as Marianus Victorius observes in his notes upon St. Jerome. 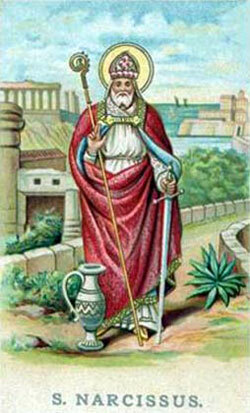 St. Narcissus continued to serve his flock, and even other churches, by his assiduous prayers and his earnest exhortations to unity and concord, as St. Alexander testifies in his letter to the Arsinoites in Egypt, where he says that Narcisus was at that time about one hundred and sixteen years old. The Roman Martyrology honors his memory on the 29th of October. The pastors of the primitive church, animated with the spirit of the apostles were faithful imitators of their heroic virtues, discovering the same fervent zeal. the same contempt of the world, the same love of Christ. If we truly respect the church as the immaculate spouse of our Lord, we will incessantly pray for its exaltation and increase, and beseech the Almighty to give it pastors according to his own heart, like those who appeared in the infancy of Christianity. And, that no obstacle on our part may prevent the happy effects of their zeal, we should study to regulate our conduct by the holy maxims which they inculcate, we should regard them as the ministers of Christ; we should listen to them with docility and attention; we should make their faith the rule of ours, and shut our ears against the language of profane novelty. O! that we could once more see a return of those happy days when the pastor and the people had but one heart and one soul; when there was no diversity in our belief; when the faithful seemed only to vie with each other in their submission to the church, and in their desire of sanctification. 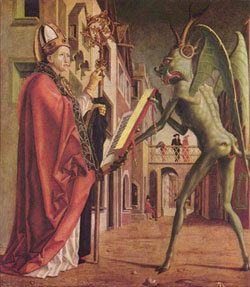 Sometimes he can also be seen holding a carpenter’s ruler or is depicted with a scroll or book, the Epistle of Jude. Biblical scholars agree St. Jude was a son of Clopas and his mother Mary was the Virgin Mary’s cousin. 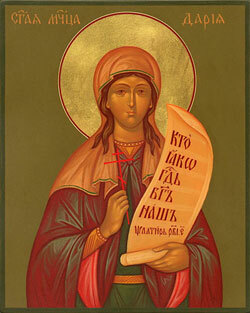 Ancient writers tell us that he preached the Gospel in Judea, Samaria, Idumaea, Syria, Mesopotamia, and Lybia. According to Eusebius, he returned to Jerusalem in the year 62, and assisted at the election of his brother, St. Simeon, as Bishop of Jerusalem. Saint Jude is not the same person as Judas Iscariot, who betrayed Our Lord and despaired because of his great sin and lack of trust in God’s mercy. He is an author of an epistle (letter) to the Churches of the East, particularly the Jewish converts, directed against the heresies of the Simonians, Nicolaites, and Gnostics. Though Saint Gregory the Illuminator has been credited as the “Apostle to the Armenians,” the Apostles Jude and Bartholomew are believed to have brought Christianity to Armenia, where Jude was rumored to have later been martyred. Following his death, St. Jude’s body was brought to Rome and left in a crypt in St. Peter’s Basilica. Today his bones can be found in the left transept of St. Peter’s Basilica under the main altar of St. Joseph in a tomb he shares with the remains of the apostle Simon the Zealot. The Chicago Police Department and Clube de Regatas do Flamengo – the Rio de Janeiro soccer team – have made Saint Jude their patron saint and there are several hospitals who have also accepted him as their patron saint, including the well-known children’s hospital St. Jude Children’s Research Hospital in Memphis, Tennessee. When Jude was mentioned in the Bible, it was often in relation to James (Jude of James) which is traditionally interpreted to mean “Jude, brother of James” as in the King James version of Luke 6:16; however, “Jude, son of James” appears in Protestant translations such as the NIV, NIRV, and the New King James Version. The same discrepancy occurs in Acts 1:13. In John 14:22, a disciple called “Judas not Iscariot” is assumed to be the apostle Jude, though critics believe it is too ambiguous to believe it is a certainty. When the apostles are listed in Matthew 10:3 and Mark 3:18, Jude’s name does not appear but “Thaddeus” does. This occurrence led early Christians to believe Jude was known as both “Jude” and “Thaddeus,” the latter of which could have been a sort of nickname. “Thaddeus” may have become a popular nickname for Jude following Judas Iscariot’s betrayal. To add further confusion to Jude’s second name, the name Thaddeus is often indistinguishable from Thaddeus of Edessa, one of the Seventy Disciples. “O most holy apostle, Saint Jude, faithful servant and friend of Jesus, the Church honoureth and invoketh thee universally, as the patron of hopeless cases, and of things almost despaired of. Pray for me, who am so miserable. “Make use, I implore thee, of that particular privilege accorded to thee, to bring visible and speedy help where help was almost despaired of. Come to mine assistance in this great need, that I may receive the consolation and succor of Heaven in all my necessities, tribulations, and sufferings, particularly (here make your request) and that I may praise God with thee and all the elect throughout eternity. Called “Abuna” or “the fa­ther’ of Ethiopia, sent to that land by St. Athanasius. Frumentius was born in Tyre, Lebanon. While on a voyage in the Red Sea with St. Aedesius, possibly his brother, only Frumentius and Aedesius survived the shipwreck. Taken to the Ethiopian royal court at Aksum, they soon attained high positions. Aedesius was royal cup bearer, and Fruementius was a secretary. They introduced Christianity to that land. 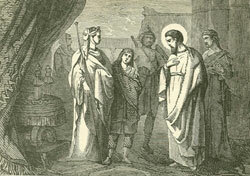 When Abreha and Asbeha inherited the Ethiopian throne from their father, Frumentius went to Alexandria, Egypt, to ask St. Athanasius to send a missionary to Ethiopia. He was consecrated a bishop and converted many more upon his return to Aksum. Frumentius and Aedesius are considered the apostles of Ethiopia. On December 16, there is named in the Roman Martyrology and in certain Irish calendars a Saint Bean in Ireland, who had been confused with the St. Bean whose feast is still observed in the Scottish diocese of Aberdeen, but on October 26, as founder of the bishopric of Mortlach in Banff which was the forerunner of that of Aberdeen. Nothing else is known about him. The fourteenth century chronicler Fordun, states that he was made bishop by Pope Benedict VIII, at the request of Malcolm Canmore, who is said to have founded an episcopal monastery at Mortlach. If true, this would be between 1012 and 1024; but the See of Mortlach is generally said to date from 1063. St. Bean’s dwelling place is supposed to have been at Balvanie, near Mortlach (Bal-beni-mor, “the dwelling of Bean the Great”). His feast day is October 26th. There is very little known about them. Chrysanthus was an Egyptian, son of a Patrician, Polemius. He was brought to Rome from Alexandria during the reign of Numerian, and despite the objections of his father, who had brought him to Rome, was baptized by a priest named Carpophorus. Chrysanthus refused is father’s attempts to get him married, finally married Daria, a Greek and a priestess of Minerva, converted her, and convinced her to live with him in chastity. When they converted a number of Romans, Chrysanthus was denounced as a Christian to Claudius, the tribune. Chrysanthus’ attitude under torture so impressed Claudius that he and his wife, Hilaria, two sons, and seventy of his soldiers became Christians, whereupon the Emperor had them all killed. Daria was sent to a brothel, where she was defended by a lion, brought before Numerian, who ordered her execution, and was stoned and then buried alive. When several followers of Daria and Chrysanthus were found praying at their crypt, among them Diodorus, a priest, and Marianus, a deacon, they were all entombed alive. Their feast day is October 25. Claretian archbishop and founder. Anthony was born in Salient in Catalonia, Spain, in 1807, the son of a weaver. He took up weaving but then studied for the priesthood, desiring to be a Jesuit. 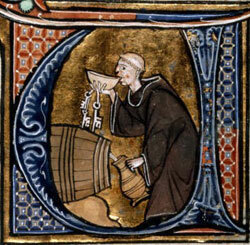 Ill health prevented his entering the Order, and he served as a secular priest. In 1849, he founded the Missionary Sons of the Immaculate Heart of Mary, known today as the Claretians, and the Apostolic Training Institute of the Immaculate Conception, Claretian nuns. From 1850 to 1857, Anthony served as the archbishop of Santiago de Cuba, Cuba. He returned to the court of Queen Isabella II as confessor, and went into exile with her in 1868. In 1869 and 1870, Anthony participated in the First Vatican Council. He died in the Cistercian monastery of Fontfroide in southern France on October 24, 1870. 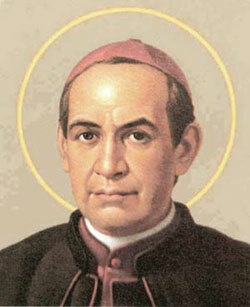 Anthony Mary Claret had the gift of prophecy and performed many miracles. He was opposed by the liberal forces of Spain and Cuba and endured many trials. 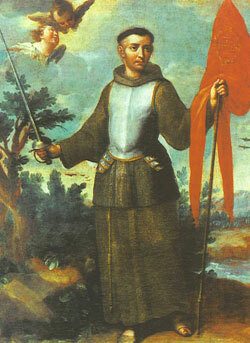 St. John was born at Capistrano, Italy in 1385, the son of a former German knight in that city. He studied law at the University of Perugia and practiced as a lawyer in the courts of Naples. King Ladislas of Naples appointed him governor of Perugia. During a war with a neighboring town he was betrayed and imprisoned. Upon his release he entered the Franciscan community at Perugia in 1416. He and St. James of the March were fellow students under St. Bernardine of Siena, who inspired him to institute the devotion to the holy Name of Jesus and His Mother. John began his brilliant preaching apostolate with a deacon in 1420. After his ordination he traveled throughout Italy, Germany, Bohemia, Austria, Hungary, Poland, and Russia preaching penance and establishing numerous communities of Franciscan renewal. When Mohammed II was threatening Vienna and Rome, St. John, at the age of seventy, was commissioned by Pope Callistus III to preach and lead a crusade against the invading Turks. Marching at the head of seventy thousand Christians, he gained victory in the great battle of Belgrade against the Turks in 1456. Three months later he died at Illok, Hungary. His feast day is October 23. He is the patron of jurists. Karol J. Wojtyla, known as John Paul II since his October 1978 election to the papacy, was born in Wadowice, a small city 50 kilometres from Cracow, on May 18, 1920. 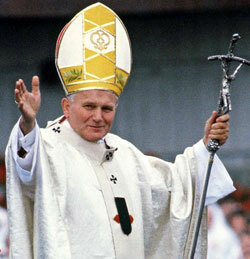 He was the second of two sons born to Karol Wojtyla and Emilia Kaczorowska. His mother died in 1929. His eldest brother Edmund, a doctor, died in 1932 and his father, a non-commissioned army officer died in 1941.